““The downgrade in the global outlook since the previous economic outlook in November 2015 is broadly based, spread across both advanced and major emerging economies, with the largest impacts expected in the United States, the euro area and economies reliant on commodity exports, like Brazil and Canada,” it warned. Indeed, according to the group’s new outlook today, economic growth in Canada could be nearer to the top of the Group of Seven industrialized nations rather than at the bottom of the pack. While that downgrade is the steepest among the G7, it would still put Canada ahead of Germany, France, Italy and Japan. However, Canada would still trail the forecast showings of Britain and the United States, at 2.1 per cent and 2 per cent, respectively. While growth of 1.4 per cent is lame, it’s not as bad as some other economists project. Those other forecasts tend to be in the area of 1 per cent or even worse. At least one suggests Canada will lag the rest of the G7. The OECD had several warnings about the world at large, notably where trade and commodities are concerned. “Sluggish growth is reflected in weak trade and has contributed to recent falls in commodity prices,” the OECD said of world economies. It also urged a “stronger collective policy response” around the world, saying central bank policy isn’t enough on its own. 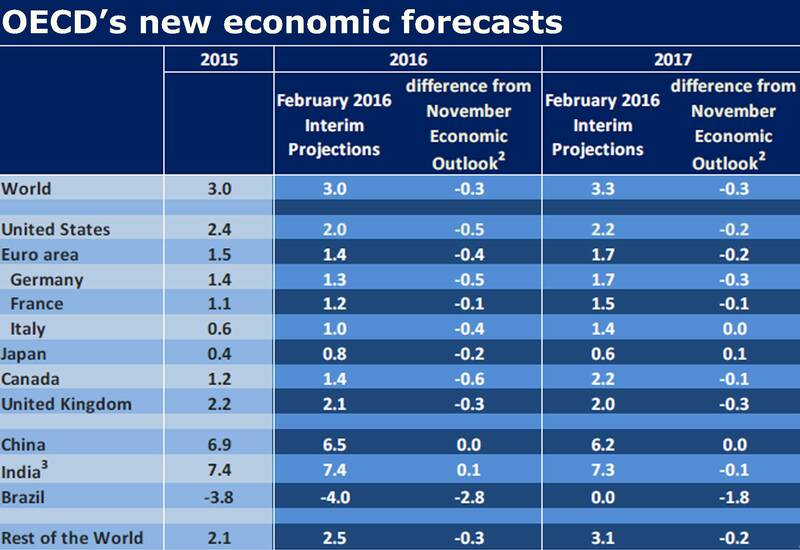 “Fiscal policy is now contractionary in many major economies,” the OECD said. “Structural reform momentum has slowed,” it added. Canada’s federal government, of course, is poised to unveil a round of infrastructure spending, but has yet to reveal details. And some economists believe Ottawa could, and will, spend more and run deficits that are much higher than forecast. For 2017, the OECD forecasts Canadian economic growth of 2.2 per cent, just shy of its November projection of 2.3 per cent. Canada would still be ahead of Germany, France, Italy and Japan, and still behind Britain and the U.S. Indeed, well behind. Fresh numbers from Statistics Canada on jobless benefits again show the hit to the country’s commodity regions. The number of people receiving Employment Insurance benefits rose in December by 2.2 per cent in Alberta, 1.6 per cent in Saskatchewan and 1.3 per cent in Newfoundland and Labrador. There are now 62,500 recipients in Alberta, double the number of a year ago. Ontario will allow 150 grocery stores to start selling wine in a bid to raise more revenue for the cash-strapped government, The Globe and Mail’s Adrian Morrow reports today. The move will slightly relax the province’s strict wine retail rules, which currently restrict sales to the government-owned LCBO and 292 wine retail outlets mostly owned by two large wineries. The government will start auctioning off the first 70 licences this summer with the aim of having the first wine on store shelves in the fall. 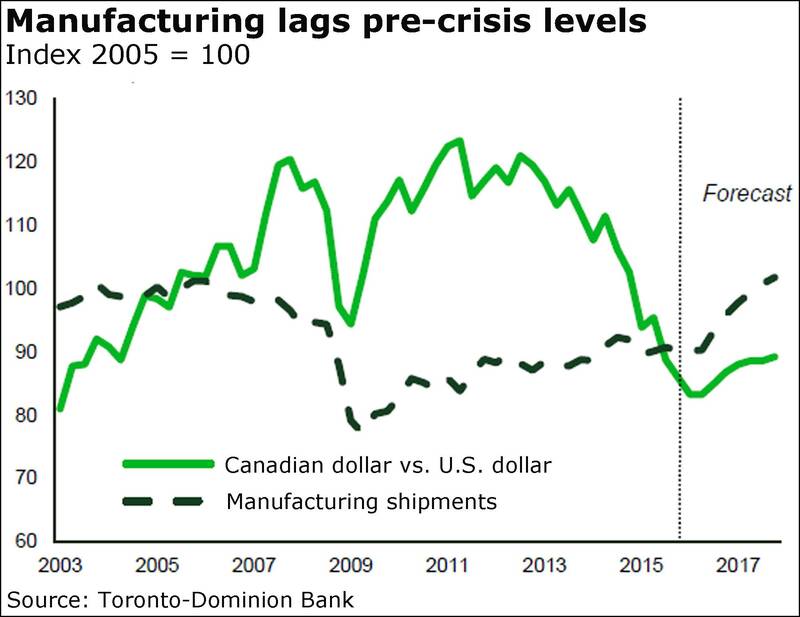 Toronto-Dominion Bank expects Canada’s manufacturing sector to play a “larger role” in economic growth going forward, buoyed by the low dollar and better demand from the United States. 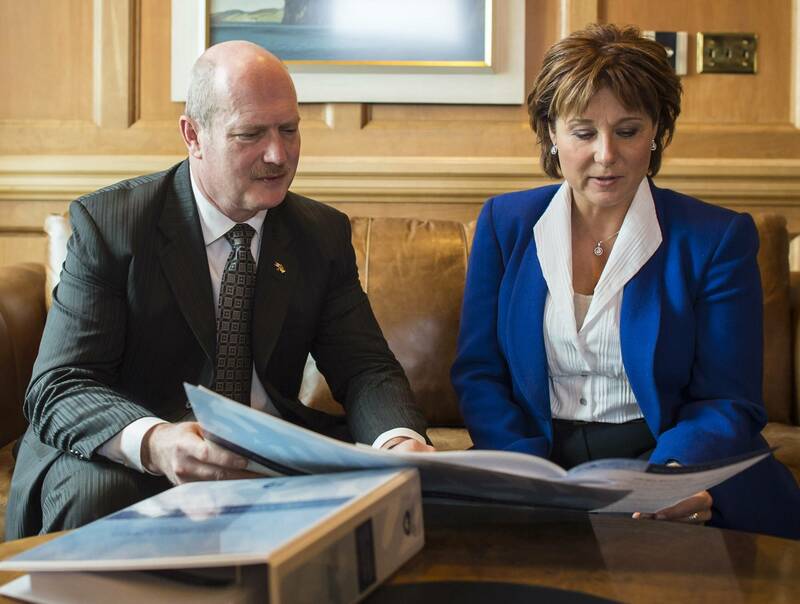 As with all things, though, some industries will fare better than others, TD economist Brian DePratto and economic analyst Nicole Fillier said in a new report. “Based on our outlook for commodity prices, the exchange rate and foreign demand, we expect a number of industries to outperform, including wood products, plastic and rubber products, and furniture,” they said. “Chemical products and primary metals may also gain via supply chain effects, and based on historical performances,” they added. Eric Reguly: Why reward Bombardier families?